When Gotham City is in desperate need of heroes, two men take a stand for justice…but on opposite sides. Bruce Wayne returns home after years abroad to become a crimefighter, just as honest cop Lt. James Gordon moves to Gotham and finds corruption at every level. When Bruce becomes the masked vigilante Batman, the city explodes as his new nemesis Catwoman, the mob and Gordon all close in! 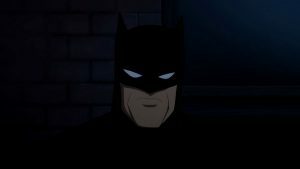 DC Universe’s original animated movie takes on one of the most acclaimed texts among Batman fans: Frank Miller’s Year One, which retold the Dark Knight’s origins as a crime fighter from a decidedly hard-boiled point of view. The feature follows Miller’s story arc faithfully, with young Bruce Wayne (voiced by Benjamin McKenzie of Southland) arriving in a vice-ridden Gotham with a decade’s worth of martial arts training and a head full of vengeance over his parents’ murder. 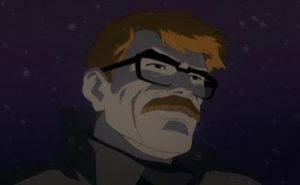 At the same time, new police transfer Jim Gordon (Bryan Cranston, Breaking Bad) settles into his job, where he discovers that the police are often worse than the criminals. What follows is an inversion of the traditional superhero story, with both men, ostensibly on the side of law and order, taking the business of saving Gotham into their own hands, with Gordon untangling the web of corruption around the city while Wayne, as Batman, adopts a more hands-on (read: violent pummeling) approach. The feature, codirected by Lauren Montgomery and Sam Liu (who previously shared helming duties on Justice League: Crisis on Two Earths), captures the visceral grit of Miller’s take, but not the depth of character and story, which made the source material so rich. Exposition is delivered through cumbersome voice-over, while the plentiful action threatens to overwhelm the scant characterizations afforded by Tab Murphy’s script. Casting is another mixed bag, with Cranston delivering Gordon’s frustration and fury with skill, but McKenzie and Katee Sackhoff (as Sarah Essen, Gordon’s lover and future wife) not quite striking the same balance. Striking the right combination of Miller’s literary leanings in the original text with the visual elements required to keep an animated feature interesting is a formidable challenge, and one that the makers of Batman: Year One got only partially right.